At the American Action Fund for Blind Children and Adults, we don't just talk about promoting the use of Braille, we pursue it in every facet of a blind person's life. The goal is to achieve the most efficient means to access information or to perform a task. For most of us, that is through Braille and Braille products. Below are some products that we offer. To order, contact American Action Fund by phone at (410) 659-9315, extension 2287; by fax at (410) 685-2340; by email at [email protected]; or by mail at 1800 Johnson Street, Baltimore, Maryland 21230. 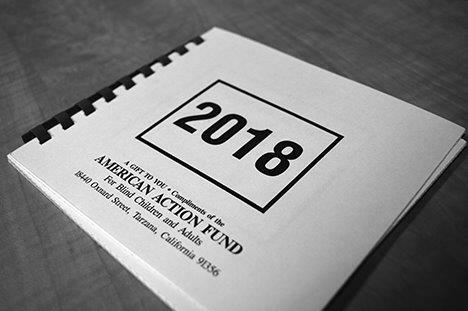 Each year, the AAF produces and distributes over 12,000 compact and useful Braille calendars to blind and deaf-blind individuals and agencies serving them. In addition to the contact information above, calendars can also be ordered by sending and email to [email protected] or by faxing a request to (410) 685-2340. The UEB Handbook of Braille Contractions (updated 2016) is an excellent reference guide for looking up Braille contractions. Arranged alphabetically in both print and Braille, it is easy to use for the beginning Braille student, blind or sighted, child or adult. This handbook can be ordered by calling (410) 659-9314, extension 2216. For more informaiton about the handbook, please send an email to [email protected]. You may also download the new BRF file. Oskar and Klaus are feline friends who are complete opposites. Oskar is blind, adventurous, and full of fun. Klaus prefers to play it safe, is sighted, and loves to lounge around the house. 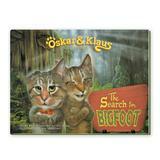 Oskar convinces Klaus to go on many adventures away from their cozy, comfortable home. 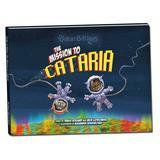 You can purchase either The Search for Bigfoot or The Mission to Cataria from Oskar and Klaus’ website at https://www.oskarandklaus.com/. With a generous grant from the American Action Fund, the Oskar and Klaus books are available in print/Braille at the same price as the print version.